Exceptional A-D and D-A conversion, digital audio interfacing in multiple formats, and Firewire connectivity make this high-end workhorse something for any studio owner to aspire to. Converter technology has come on in mighty leaps and bounds since we all went digital in the early 1980s following the introduction of the CD. Cambridge-based Prism Sound have been one of the standard bearers for conversion technology since 1994. The company's flagship two-channel Dream converters, the AD2 and DA2, are probably the most technically accomplished currently available — not to mention the most neutral and transparent sounding too. I have heard them described as 'severely uneconomic', but then we are well into the realms of diminishing returns, in which proper no-compromise engineering costs significant money! However, the subject of this review is a modular and multi-channel A-D and D-A system, the ADA8XR, which has to rate as one of the most complex and comprehensive converter systems I have ever reviewed. This nominally eight-in, eight-out system costs roughly the same as a single AD2 or DA2, so makes multi-channel working for surround applications much more practical and cost-effective. While it is fair to say that the ADA8XR doesn't quite match up to the stratospheric specifications of the AD2 and DA2, it is still seriously impressive, both technically and sonically, and Prism Sound's veneration of engineering excellence is still very much to the fore. Full specifications are available on the Prism Sound web site, but to give an idea of the standards we are talking about here, spurious anharmonic artifacts are stated as being below -130dBFS and distortion is under 0.0006 percent. Believe me — these are very good figures indeed! Prism's flagship AD2 and DA2 converters employ discrete converter circuitry and bespoke digital algorithms to achieve the necessary degree of filtering resolution and overall performance. However, this approach requires a lot of power, and the boxes get surprisingly hot. Using the same approach in a multi-channel unit would necessitate cooling fans and a much larger enclosure than would be commercially acceptable. Consequently, the ADA8XR converters are based around off-the-shelf monolithic devices, but the very best ones currently available. The current D-A card uses AKM AK4395 chips, while the A-D card uses Cirrus Logic CS5381 devices, but these choices will apparently be reviewed and updated as the chip manufacturers advance their products. Prism Sound's view is that the latest generation of converter chips is no longer the weakest link in the chain, and that it is the proper engineering of clock recovery circuits, board layouts, analogue interfacing, and linear power supplies that determine the overall performance. The multi-stage PLL clock recovery technology employed in the ADA8XR is based closely on that developed for the AD2 and DA2 products, and, as in those units, complete galvanic isolation is maintained between the analogue I/O and the rest of the system. All internal digital signal processing is performed with very high resolution and at very high sample rates — internally the unit operates at 352.8kHz (the DXD rate, which is eight times 44.1kHz), an intermediate sample rate widely used for converting between the various PCM configurations and Sony's DSD format. The entire operation of the unit is also controlled through field-programmable gate arrays (FPGAs) which can be updated via software, and that makes the ADA8XR completely future proof, thus helping to justify its cost to the accountants! Various analogue and digital signal-processing facilities are built into the unit, starting with a function on the A-D cards called Overkiller. This is a progressive peak limiter intended to prevent unintentional overs from transients. Analogue input and output levels can be adjusted through the menu control to set 0dBFS anywhere between +5dBu and +24dBu in 0.5dB steps. Channel balance can also be adjusted in 0.05dB increments over a ±0.5dB range. That's what I call precision! Word lengths of 16, 20, and 24 bits are supported, and several different Super Noise Shaping options are provided to maximise sound quality when reducing the word length. Prism Sound's own MRX word-mapping (also known as bit-splitting) system is also included, allowing 24-bit word lengths (at samples rates up to 96kHz) to be stored on 16- or 20-bit multi-channel recorders. This feature takes priority over the DRE function described below, as the two are incompatible. A large range of different digital interfacing cards are available for the ADA8XR, including options catering for AES-EBU (left), Pro Tools Mix systems (centre), and SDIF 2/3 and SuperMAC (right).Photo: Mark EwingThe company's unique Dynamic Range Enhancement (DRE) coding scheme is also incorporated in the ADA8XR, allowing 20-bit signals to be stored on 16-bit media (or 24-bit signals on 20-bit media) without sacrificing tracks. However, the notion that 20-bit signals can be stored on and recovered perfectly from 16-bit media is, of course, nonsense. The Prism Sound DRE algorithm manages this feat subjectively by ensuring that small and moderate-level signals (up to about -20dBFS) are encoded accurately on the available medium. Higher level signals are encoded in a data-reduced format, but that loss of data is 'optimally concealed' through masking techniques. This situation is the reverse of that provided by conventional perceptual sub-band coders, which generally have very poor low-level resolution. Digital inputs can be routed directly to digital outputs with format conversion or signal processing as required, and synchronous sample-rate conversion is available, if required, by installing the DSD interface module which incorporates additional DSP power. 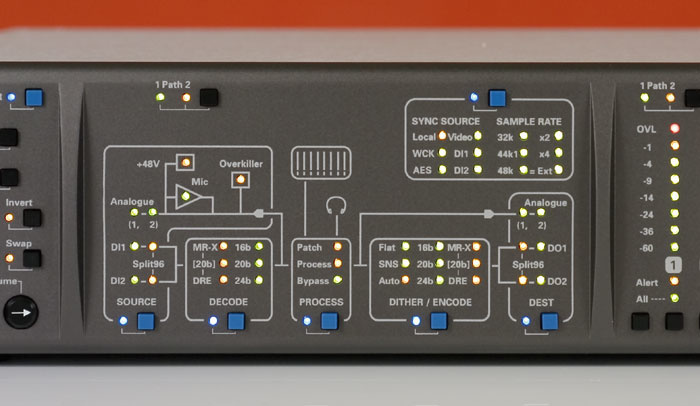 Clocking options include the internal crystal references, external word clock, AES11, video, or any of the digital interface inputs — and the reference clock can even be at a different sample rate to that of the channel path it is synchronising! Very sophisticated jitter rejection is provided for external clock sources, naturally. I tested the review unit with the standard AES interface, but other options include two DSD I/O modules (one with SDIF 2 and SDIF 3 interfacing, and the other adding SuperMAC interfacing to the SDIF 2 and SDIF 3) and dedicated interfaces for Pro Tools 24 Mix or HD systems. The latter connect directly to the Pro Tools hardware in place of the corresponding 888 I/O for the 24 Mix system, or the 96 and 192 I/O interfaces for the HD system. The latest addition to the interface module range is an eight-in, eight-out Firewire interface equipped with two six-pin IEEE 1394a connectors to enable direct connection with a range of MIDI + Audio sequencers including Apple Logic, Steinberg Cubase SX, Steinberg Nuendo, and others. For larger systems, multiple ADA8XRs can be used together. 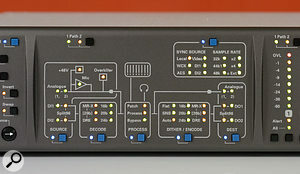 One of the examples given in the handbook is of a system based on a Logic or Nuendo DAW providing eight analogue inputs, 24 analogue outputs, and four stereo AES interfaces in and out — all tied to the computer via Firewire. In this scenario, the first ADA8XR unit would be fitted with an A-D card to provide the eight analogue inputs, plus a D-A card for the first eight analogue outputs. It would also have a Firewire interface to exchange the eight input and output channels with the computer, and an AES card. The second ADA8XR unit would be fitted with two D-A cards for the remaining 16 analogue outputs, and two more Firewire cards to hook them into the computer. Physically, the ADA8XR is a 2U rackmounting unit that extends roughly 380mm behind the rack ears. The rear panel has five module slots: two for analogue interfaces, two for digital interfaces, and a utility module. The small amount of space remaining is given over to the integrated IEC mains inlet, voltage selector, fuse holder, and power switch. The utility module provides the stereo monitor output in both analogue (on phono sockets) and digital (S/PDIF on a BNC connector) formats; AES11 reference clock in and out (on XLRs); word clock in and out (on BNCs); and an RS232 communications socket. The word-clock input will also accept AES-3id, S/PDIF, and video syncs. The front panel is best described as 'busy', but everything is clearly labelled and it's obvious that a lot of thought was applied in designing the layout. Starting at the left-hand side is a button to switch the unit between active and standby modes, and a stereo headphone socket. The first control-panel section provides the stereo monitoring functions, enabling any individual channel or combination of channels to be auditioned, with level and panning facilities to create a suitable stereo mix. The review unit shipped with eight-channel A-D and D-A cards, plus Digidesign HD and Firewire digital I/O.Photo: Mark EwingThe largest control section is laid out as a 'mimic panel', showing the signal paths and functional blocks of the unit, and providing control access to each stage and process. The display applies to the channels selected in the meter panel, which is the next section to the right, containing eight bar-graph meters switchable to show levels in the A-D or D-A signal paths. Channel Select buttons below each meter are used to assign the mimic panel to adjust the parameters of the required channels. The final control section is the menu panel, with an LCD display and the usual set of navigation buttons. When the machine is first powered it displays the current Firmware version — v2.07 in this case. As you might expect, the menu structure is pretty expansive, but blue buttons on the other panels provide direct access shortcuts to various key functions, making it a little easier and quicker to change configurations. This panel section also contains buttons to load and store user and factory operating configurations. There is mention in the handbook of an option to install additional DSP, and the hardware does contain provision to accommodate a second DSP board. However, Prism Sound have not released this option yet, despite the fact that the relevant hardware is already used in other products. The only current function that requires additional DSP power is sample-rate conversion, and if this facility is required Prism Sound recommend installing the DSD module instead, since this has its own onboard DSP to perform the same multi-rate digital filtering processes anyway. The analogue I/O is all on electronically balanced XLRs, with fully adjustable line levels under Menu control, as already described. The AES interface is via a 25-pin D-Sub connector which is wired according to the Genex protocol (as opposed to the utterly incompatible Tascam, Yamaha, or Euphonix standards). Suitable breakout cables were provided, so getting signals in and out was very straightforward. The mimic panel can be switched between one of two signal paths — Path 1 is normally the A-D path and Path 2 is the D-A Path, each Path being eight channels wide. When Path 1 is called onto the mimic panel, LEDs are used to show which analogue input is connected to the processing block (with monitoring and metering outputs), which processes are in use in the word-length reduction, dither and MRX/DRE encoding section, and finally which digital outputs are being used with which format (single- or dual-wire connections). The Source section also has provision to show when a mic amp is engaged and phantom power applied — not that a suitably equipped input card is currently available, but it goes to show the kind of foresight the Prism Sound engineers have applied to this product. Currently, there are no functions associated with the processing block, and it is permanently shown as bypassed. Photo: Mark EwingThe second path shows which digital input feeds the decoding section, which indicates whether the MRX or DRE algorithms are in use and the recovered word length. The signal path is then shown passing through the (bypassed) processing section and on to the analogue outputs. A separate section of the mimic panel highlights the relevant clocking arrangements. Each section of the mimic panel has an associated blue button, and pressing this calls the appropriate menu function directly to the LCD window so that parameters can be adjusted. In cases where there is more than one relevant menu, repeated presses of the blue button cycle around the appropriate options. When you return to this kind of multi-level menu you are taken automatically to the most recently used option, rather than to the start of the menu loop again. Inevitably, this all sounds rather complex — and there is certainly a great deal of configurability and flexibility here — but in practice the operation is remarkably intuitive and logical, and the excellent handbook is only needed for the more technically advanced and obscure functions. Most signal-routing and processing functions are applied across all eight channels in a path, but there are situations where the processing is appropriate to individual channels — such as when applying word-length reduction, for example — and in these cases the relevant channel can be selected by pressing the corresponding button under the meter display. So, working through the mimic panel, it doesn't take long to manually configure the signal flow from analogue input to AES outputs, and vice versa. Of course, such a simple and obvious configuration is also available instantly as a factory preset — with different presets provided for different sample rates and word lengths. There are also factory presets for routing a digital input back to the same digital output via truncation and noise shaping — ideal for formatting a 24-bit signal to a 16-bit output, for example. The 24 presets can be recalled directly from the front panel in four banks of six. Trying to assess and evaluate the sound quality of the ADA8XR is extremely difficult, simply because it is so good! It provided a degree of transparency, resolution, and sheer realism that was unmatched by anything else available to me — which included the Benchmark ADC1 and DAC1 stereo converters, a Bryston SP1.7 surround controller, the Apogee PSX100 A-D/D-A, the Drawmer DC2476 mastering processor, and the Yamaha DM1000 digital mixer. The Prism Sound ADA8XR is a very serious piece of equipment targeted primarily at the professional, and it delivers seriously professional results. The Benchmark converters, which perform very impressively and punch well above their weight, gave the Prism Sound a decent run for its money — reliably identifying the difference between the Benchmark and Prism Sound proved surprisingly difficult. However, I was comparing separate two-channel converters with a single eight-channel unit, and the Benchmark products have minimal signal processing capabilities, so all this must be factored into any performance/cost analysis. Performing direct A-B comparisons between the Prism Sound and all the other systems, the latter consistently seemed acoustically veiled and obviously less detailed or precise — regardless of the sample rates. The Prism Sound just sounded more natural, more effortless, and (dare I say!) more analogue. If you need the best in multi-channel interfacing for your DAW, the ADA8XR is the obvious choice. But don't audition it unless you can beat your bank manager on the golf course — you won't be able to walk away from it once you've heard it! Superb build quality and technical support. Sophisticated and versatile processing and encoding options. State-of-the-art sound quality for a device of this type. Pragmatic and intuitive user interface. Engineering of this quality will always be expensive. A very powerful and extremely flexible multi-channel converter built up to a quality, rather than down to a price. Everything about it impresses: the construction, the sound quality, the processing options, the I/O flexibility, the usability, and even the handbook! ADA8XR systems vary in price depending on the cards installed. A typical ADA8XR setup incorporating eight channels of A-D/D-A conversion, eight-channel AES digital I/O, and Pro Tools HD interfacing costs £7596.38. A simpler system with eight-channel A-D/D-A conversion and Firewire interfacing would cost £6991.25. Prices include VAT. Prism Sound +44 (0)1223 424988.